Amid repairs last week to a home in the English town of Cheltenham, one of the most famous murals by the graffiti artist known as Banksy ended up accidentally reduced to rubble. 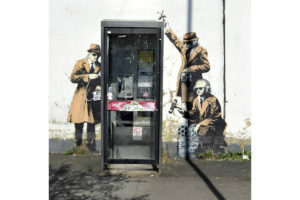 The artist had painted “Spy Booth,” depicting spies holding up listening devices, on an exterior wall of the house, around an actual public telephone booth. This fiasco followed the discovery in July that Australian construction workers had inadvertently destroyed three Banksy stencils in Melbourne, bringing to five the number of the artist’s works that had vanished on one stretch of road.